Take gravel road past Hwy 28 bridge over creek. 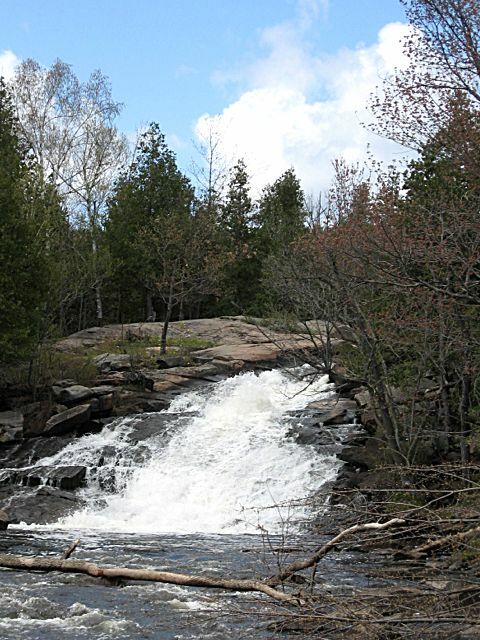 Campsites are available at High Falls. Canoed this route May 15/16, 2010. Very easy paddling. Camped overnight at High Falls... good site, but very popular. Some broken bottles and garbage (unfortunately) clustered around some of the most popular camp fire spots, but overall, not too bad (probably a lot worse after the May 2-4 weekend). Most of the "rapids" were easy to paddle through, with the exception of the impassable Steps and High Falls (of course). The trail from High Falls to the Petroglyphs Park Visitor Centre is about 9km one way and only partially maintained (it is 4.5km to the Park boundary). This is unfortunate as it is a nice hiking trail. Many of the water crossings are in poor shape, but still usable. Checkout this trail while most of the water crossings are still intact. Canoed the route July 6th 2006 with two kids 10 and 13. Great ride, nice scenery. Saw beaver, snakes. Kids caught some fish trolling with lures. Put in at 11 am and finished at 5 pm. Portaged 18, 54, and 162. Had lunch at campsite just downstream of P18. Still lots of garbage at high falls. Several of us paddled this route the first Saturday in May. We had 2 canoes and 3 kayaks that went. Fantastic paddle. Saw deer, mink and several birds. Started paddling around 10:30am, had a leisurely paddle the entire way and stoped for a nice lunch on a open fire at high falls- finished at 3:45pm. And we paddle very leisurely. 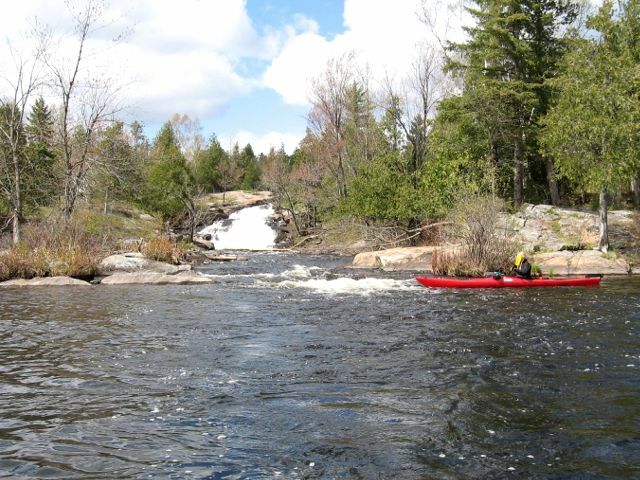 Only had to portage 2x- at the cataract and high falls- all the other "rapids" are easily navigated. Highly recommend this route! This is a great beginners route no problem for children. The falls are obvious with little to fear. The portages are not very difficult. The river (creek) is outstanding in its beauty except for the campsites at the falls. The lack of care and consideration in the way of debris was very disturbing. May I be so bold as to suggest if you have the room and altruistic nature, that you bring a few garbage bags and haul some of the garbage out if you can. Apart from this it was gorgeus. The water lillies and vegatation guild this natural wonder. We spotted a large Herron dropping in, at the falls. 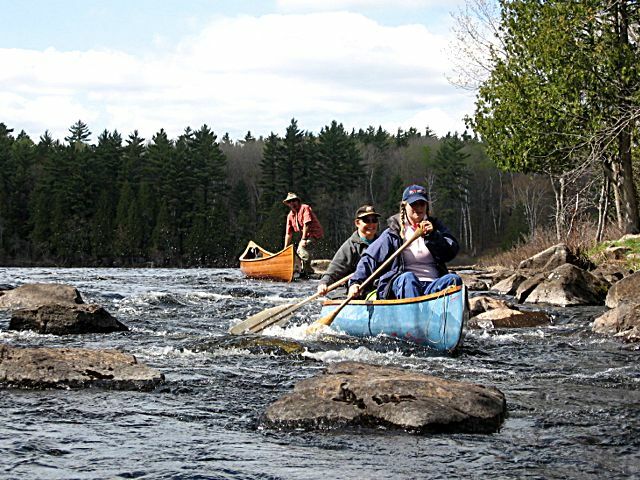 There are also camping spots right after the first portage to the right, beside the small falls as well as directly across the inlet. There also another campsite on the left hand side after you complete first the left turn and then the right turn after the falls. These campsites over the years have slowly become quite messy due to inconsiderate campers. Just completed this trip (June 2012). Water levels were low for this time of year but a great trip regardless. I started at Haultain Rd down to Northeys Rd in a quick solo canoe and it took 2 hours with quick portaging. Saw snakes, beaver, many waterfowl, purple trilliums, and then many drunk teenagers at High Falls. Place did not look too dirty but High Falls is where the nature ends. This is a great morning or evening paddle route. Would be very fun with high water flows. Caution, there is no portage marker for High Falls and you may feel confident coming up on it after running some nice class 1 chutes just prior. If it were not for the teenagers standing there I may have gone for it (ouch!). You also do not hear the falls as much as you might think but this may have been due to the wind storm that I was paddling in today.